Earning residual income can provide a great feeling of relief. You’ll have more money to meet your needs, save, pay off debt and more. 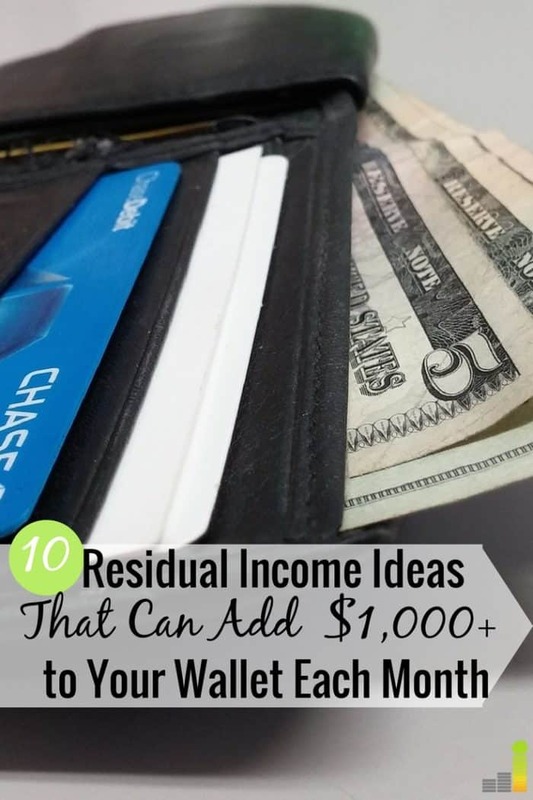 Many residual income ideas let you make money while you’re doing other things! If you find a side hustle that allows you to make extra money during your spare time or have the ability to work overtime at your job, you’ll no doubt be grateful but there will always be a cap to how much you can earn. It’s easy to get caught up in the cycle of trading your time and energy for dollars and while there’s nothing wrong with earning an active income, you should always include strategies around how to create residual income as part of your overall personal financial plan. Residual income (also referred to as passive income) often requires a lot of work upfront in the beginning stages, but over time the passive income ideas we share here empower you to bring in money without your direct involvement or active work, thus freeing up more of your time. 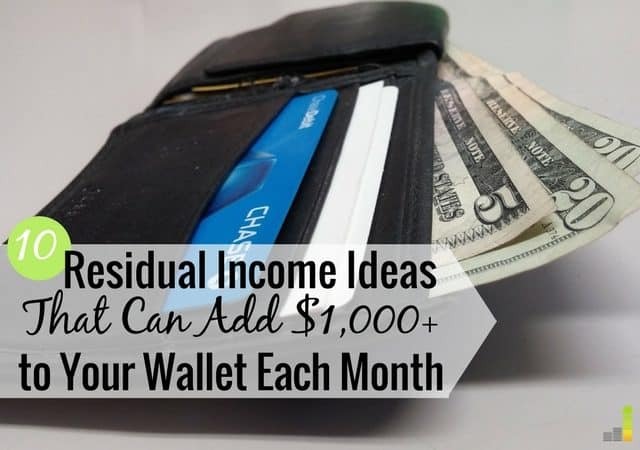 Just in case you’re not yet sold on the value of residual income ideas, I want to spend a minute talking about what makes earning passive income worth your time and attention. After all, you might be thinking that you like working at your job and bringing in a steady income each month and wondering what’s so bad about having an active income? You might be asking yourself why you need to look for residual income opportunities in the first place. For starters, having multiple streams of income allows you to be more financially stable – here are some other signs of financial stability. If you have one job that you love and enjoy, that’s great, but you have to think about what protection you’d have if that income stream suddenly went away. Also, consider how you’ll make ends meet if you wish to retire someday. Before retirement, you must have a backup plan for how you will make money if you couldn’t work actively for an extended period of time or if you just want to take some time off to refuel. If you’ve already thought, for example, about how to earn residual income online, and have put the time into creating that as an income stream, you’ll already have money coming in when you need it at an unexpected time. Finally, consider what you could do if you were able to buy more of your time back. Even if it’s just five hours per week, imagine how much more fulfilling your life would be and who you could spend more time with if you had some residual income coming in during those hours. You wouldn’t have to work during them but instead could spend them as you like. Unlike active income, residual income isn’t limited to the number of hours you put in. Plus, anyone can get started since there is a wide variety of options available to you. Here are three of the best types of ways you use to start creating residual income right now. Investing is one of the best ways to create residual income although it can be a long-term process. Within this passive income strategy, there are multiple options you can choose. One of the most attractive ways to generate passive income is by investing in dividend paying stocks. Yes, you will experience loss in the stock market. However, it’s one of the best ways to create wealth over the long-term. When you add in the benefit of stocks that pay out a regular dividend, it only helps aid those wealth building efforts. Ally Invest is a great option to build a portfolio of dividend paying stocks as they have many tools to help with your investing, have no minimum balance requirement and have the lowest trade price in the industry – as low as $3.95 per trade. For those wanting assistance with their investing, Betterment is a good option as they have no minimum balance requirement and they manage your investments for you. If you want to start investing but have a small budget, I’d recommend taking a look at Stash. Stash is an online platform that allows you to invest in socially responsible causes. You can open an account with Stash and get started with as little as $5 and transfer amount weekly. All new investors get the first month free then there’s a monthly fee of $1 for accounts with balances under $5,000 and an annual fee of 0.25% for accounts over $5,000. Another way to earn passive income through investing is through peer-to-peer (P2P) lending. With P2P lending you essentially act as a bank to those needing funds for a variety of needs. P2P lending can be a good way to add some diversity to your investing portfolio, and can provide a decent return on your investment. Sites like LendingClub can allow you to earn an average return of 6% – 10% on your investment and you can allocate your loans to provide diversity and protect against defaults. A third type of investing you might want to consider is real estate investing. You can buy a property and rent it out as a landlord or participate in crowdfunded real estate through companies like Fundrise which allows you to get started with as little as $500. You may not have the time or knowledge to know how to manage real estate investing. Going the crowdfunded route allows you to get the benefits of investing in real estate without the associated headaches. If traditional investing methods have scared you away, you can always go the old school method and put your money in a savings account. CIT Bank currently pays 1.85 percent on their money market account, when you start with at least $100, which is more than 15X what you will find at a traditional bank. One of the new age ways to start building residual income is to make money online and set up systems and processes to make the income passive. As with investing, there are multiple options for you within this broader category of earning residual income online. You typically need your own website if you want to earn residual income online. If you start a blog or niche site, you can monetize it with display advertising, affiliate marketing and even sell digital products. Starting your own website may feel difficult. It’s not. A website can be set up relatively simply, even if you’re not technically inclined. If you’re new to working online, Bluehost can launch your site with a few simple clicks, and provide your domain name free for the first year, for only $2.95 per month. You may also need a website to run an e-commerce store. Shopify is a great option to sell wholesale items on the Internet. Shopify helps you create an online storefront you can use to sell products. If you prefer video content, you can start a YouTube channel. YouTube’s monetization rules recently changed making it not as simple for everyone to start monetizing right away, but this shouldn’t deter you if you’re serious about putting out quality and original content. I believe the new rules are more to filter out low-quality, explicit, and duplicate video content on the site. If you have some experience or expertise in a specific niche, you can create an online course for a variety of niches. Once you create the core lessons and materials, all you have to do is market and sell it. It would be wise to set up a marketing funnel to help bring in course sales consistently. There are many residual income opportunities to be had online, if you think outside the box and are willing to put in the work. The third best way to create residual income is by renting out what you own. This requires little to no effort and can provide you with a nice chunk of money as a solid additional passive income stream. First, if you have space in your home whether it be a spare room, basement or your entire home if you travel often, you can advertise to rent it out to travelers on Airbnb. If you live in a busy area or city with lots of tourist attractions, you can really maximize your earnings. Check out our Airbnb host checklist to learn how you can make more money renting out your property. If you own your car outright and don’t drive it often, you can rent it out to others with a service like Turo and make several hundred dollars per month. A number of things dictate how much you can make through a service like Turo, such as how often you make the car available. Just make sure you know the particulars of coverage on your car prior to signing up. If you want more than one platform to rent your car, consider GetAround as an alternative to Turo. You can make up to $800 per month renting your car on GetAround, according to their website. Option #3 – Rent Whatever You Can Think Of – Get Creative! As you can see, there are many residual income opportunities you can pursue. Setting up passive income streams does take time and work, but with some persistence your efforts will pay off in the long run. Why do you think many don’t realize the power of passive income? What are some other ways to make residual income you’ve seen be successful? How do you stay motivated to make extra money when you work a full-time job?